comment Celebrating diversity at the place where dreams come true! Here's a sneak peek at some of the incredible things we have lined up, ready to make Magical Pride a truly unforgettable experience. Spectacular music, live performances from Years & Years and Corine. The Magical Pride Standard Ticket gives you access to Walt Disney Studios® Park from 8pm until 2am and to a selection of attractions open during this event, as well as Character Meet 'n Greets. The Magical Pride Plus Ticket gives you admission to Walt Disney Studios® Park from 4pm until 2am (and Disneyland® Park from 4pm until official closing time) and to a selection of attractions open during this event, as well as Character Meet 'n Greets. ©Disney and The Twilight Zone® is a registered trademark of CBS, Inc. and used with permission pursuant to a license with CBS, Inc.
You will be emailed a gate-ready e-ticket Disneyland® Paris Magical Pride E-Ticket that must be printed on receipt. Upon arrival at Disneyland® Paris, simply scan the barcode at the gate for admission to the park. 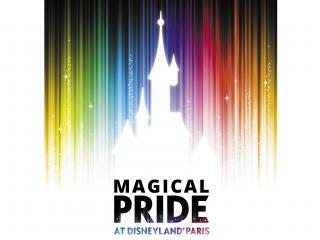 Your Disneyland® Paris Magical Pride E-Ticket will be emailed to you within 7 days of booking. If you are travelling before that time, please call us to book. This ticket allows you to enter the park from 8.00pm, if you purchase the "Plus" ticket you can enter either park from 4pm. Magical Pride is recommended for Guests aged 18 and older. All Guests will be required to show a proof of age at alcohol selling points. If you choose the "Standard" Disneyland® Paris Magical Pride ticket this is only valid for entrance into this special event held at Walt Disney Studios® Park. If you purchase the "Plus" Disneyland® Paris Magical Pride, you can enter either park from 4pm. What time does Magical Pride start? Magical Pride 2019 takes place from 8.00pm - 2.00am. If I am already in the Park, how do I exchange my ticket for the Magical Pride wristband? You will be required to leave the Park and re-enter using your Magical Pride ticket to receive your wristband. Magical Pride is recommended for Guests ages 18 and older. All Guests will be required to show a proof of age at alcohol selling points.